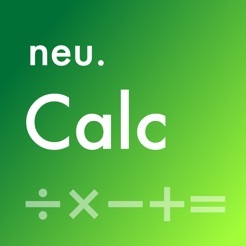 neu.Calc is an innovative financial/scientific calculator, which makes complex calculations much easier than traditional calculators or spreadsheet applications. 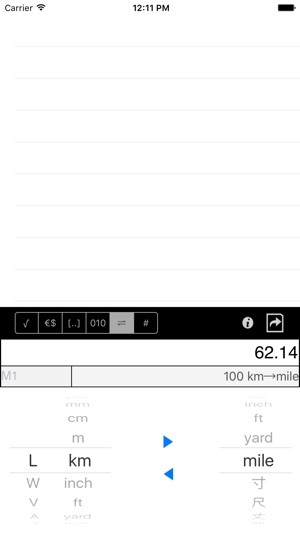 Also includes unit conversion and a programmer's calculator. 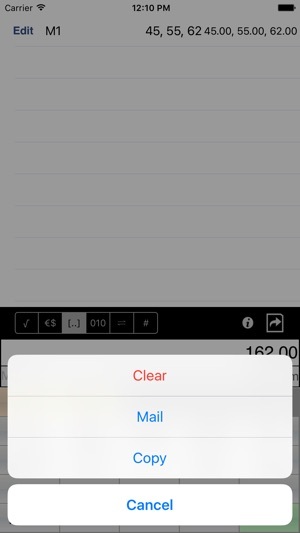 One of the unique features of neu.Calc is the ability to deal with a series of numbers (list) directly. 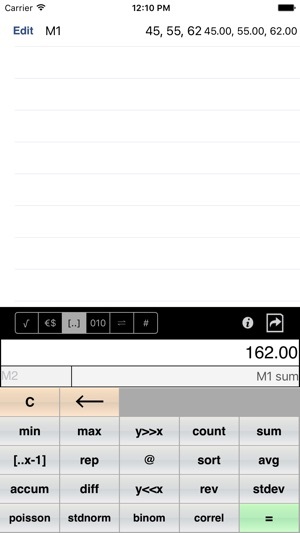 If you want to calculate the average of a series of numbers, simply input the numbers a list, then tap the "avg" button. If you want to calculate the internal rate of return for a series of cash flows, input those numbers and tap the "IRR" button. Each time the "=" button is used, neu.Calc creates a formula. Each formula is automatically labeled (M1, M2, M3, ..., ) and can be referenced by other formulas. To reference an existing formula, tap on it in the sheet. 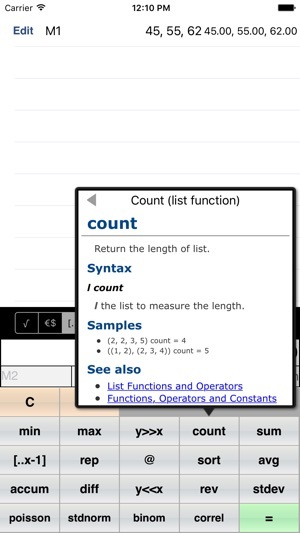 Labels can be changed by tapping on the label to the left of the formula, when the formula is being entered or edited. Solver is a powerful tool to solve linear equations. In order to solve an equation, you need to first create a formula for an unknown value with an estimate, and create a formula (or formulas) that represents the equation. Here is a simple example to solve the equation "x * 2.5 = 100", where the estimate is 10. 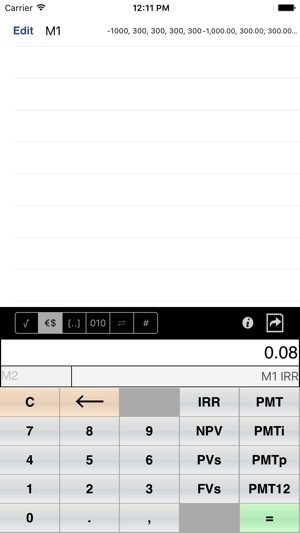 In order to get the appropriate value for M1 (x in the original equation) that makes the result of M2 zero, tap the "Edit" button of M1, then the "Solve" button of M2. You'll get the following result. To demonstrate a more complex case, take a look at the NPV example again. If you want to know the minimum yearly income to justify this investment, tap the "edit" button of M2, and tap the "solve" button of M5. You'll get this. Calculator with history tape. At first I thought the tape was overly large but I found out there is a reason for this. 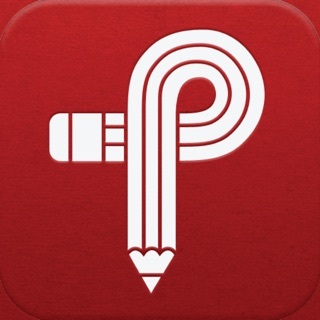 Works on iPad and iPhone. Fast and easy to use. Small size and currently free. This is my main calculator. Each operation, result and a label are stored on the tape in one line. 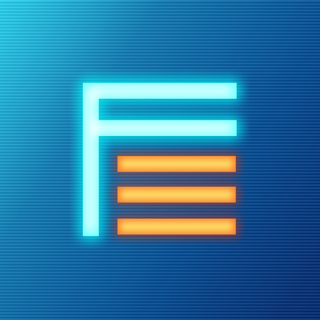 You can click on any line on the tape and use the result in a new operation. You can also input a set of values as a single result. You can do operations on the set of values like in a spreadsheet like sum and ave.
You can edit a line on the tape. Change the label. You can even change the operation or result. This will change any other operations using this result on the tape. For trig functions there is no degree mode. 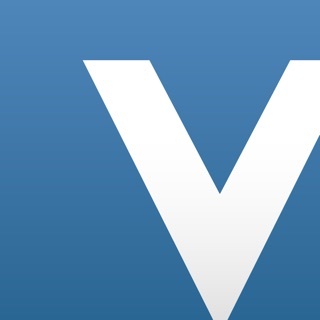 You simply enter the value, then the degree symbol (small circle) and then press SIN. There is a base (hex,oct), financial and converter sections. These allow access to the buttons. If you change to hex and go to scientific calculator you are still showing hex numbers. The converter has several standard units for length, speed, area, volume, weight and temperature. Then there are some non-Arabic character items for units. Not a big deal. I enjoy using this calculator on a iPad 2 wifi with ios 6.1.2 with no issues or problems found. The program will now crash when you try to change the number of decimal places. All calcs must be cleared individually on my ipad air2, currently upgraded to IOS9+. Works fine on old iphone 5s, running older IOS operating system. Ap has been up dated and the CLEAR function is worst than previously reported. IPad Air2 is completely up to date in operating system.